The monks denounced him as a son of a slave. Others considered him a mongrel. Even the priest who reluctantly baptized the boy predicted he would become a beggar. Instead, Martín de Porres, the humble child of a Spanish conqueror and an African slave, would one day claim the mantle of a saint. The trajectory of the Catholic church’s first black saint in the Americas bursts to life in this picture book told with simple, lyrical power by acclaimed novelist Gary D. Schmidt (Lizzie Bright and the Buckminster Boy). The author gently shows how this boy from the Lima barrios preserved his tender nature and strengthened his spirituality, making for an unusually thought-provoking picture book. The respectful yet vivid tone is enlivened by David Diaz’s mixed media illustrations, which revel in a range of rich jewel tones reminiscent of stained-glass windows. Employing interesting perspectives and a dramatic sense of movement, the acclaimed illustrator heightens the effect of a quiet, moving story. Readers see Martín playing with his sister on the rooftop, for instance, and multiple scenes with animals hovering near the sweet child. The illegitimate boy’s life brightened when his wealthy father returned for him and his sister, gave them his surname, and in time, apprenticed Martín to a cirujano in Lima. A cirujano performed the combined duties of a dentist, doctor, and barber. This change ushered in a time of miraculous deeds, and news of Martín’s gift for healing spread. Martín instead began a new life as a servant, mopping floors, cutting the monks’ hair, sweeping the chapel, all the while submitting to the brothers’ heartless prejudice against him. Martín continued to heal—wounded dogs, desperate villagers, and eventually, the brothers in the monastery and even the Spanish royals, whom Martín tended after he had helped the poorest in the barrios. After 13 years of such service, Martín’s wish to join to the monastery as a brother came true. Strange and wondrous stories followed Martín throughout his life. Some said he walked with angels or could appear in two places at once. Others said his lemon and orange trees produced fruit all year long. When he brought bread to the hungry in the barrios, the food seemed to multiply so that he always had enough. The story of this “rose in the desert,” as his mother called him, is an uplifting tale of compassion and triumph. Here’s a humble hero worthy of admiration. 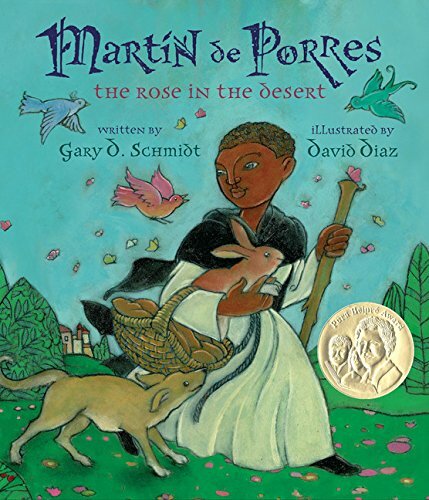 The author’s note supplies additional background information on Martín de Porres, born in 1579 and canonized in 1962. He is the patron saint of universal brotherhood, interracial relations, social justice, public education, and animal shelters.